Oh, Ebay. It’s a great place to find the wonderfully amusingly mundane. And guess what. You can buy the wonderfully amusingly mundane. Or you can simply download the wonderfully amusingly mundane for free. You can be the proud owner of the image above for only $3.75 (shipping included). 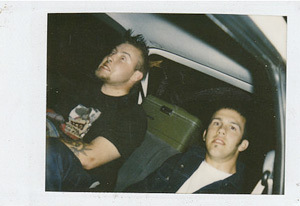 It is appropriately titled, “VINTAGE POLAROID SCARY GUYS IN CAR”. Scary indeed.